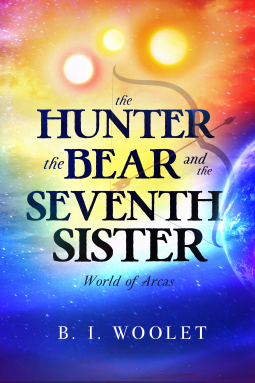 The fantastic astronomer-author duet of Benji and Ila Woolet have been gracious enough to stop by my blog for an interview of their first book ever, The Hunter, the Bear, and the Seventh Sister. This is a fantastic read for adults and their kids in middle school. The novel is a fun blend of education and fast-paced adventure. You can see my full review here. Amy) You came up with such an interesting blend of science and fantasy. I really enjoyed the astronomy ties in your characters. Where did you decide to pull these great characters from space to the blank page? B.I. Woolet) About the same time we decided to write a fantasy story, we bought our first telescope. We had grand visions of Nasa pictures bursting with color and power through the small lens. All we got was a barren, gray, and holey moon. While we saved up money for a “real” telescope, we started looking more at the night sky to find constellations. For star gazing, the constellations are like little maps that help you find hidden treasures between stars with a telescope. It didn’t take long for us to fall in love with Orion, Ursa Major, and the Pleiades. We didn’t just want to leave them up in the sky at night; we wanted them to come to life. One by one, the characters in the stars were added to our story until we gave the entire story over to their charms! It took a lot of research, but we love that we can tell a fun adventure story and also inspire people back to the stars. Amy) As authors, it is easiest to write from experience. From what I have seen of your planetarium fundraisers and promotions, you really know your stuff. Do you plan on continuing the astronomy theme throughout this series? B.I. Woolet) In all honesty, we are totally amateurs in the astronomy world (and as Benji tells people, we are amateur-amateur astronomers) But we love it! We learned most things from our own research, but now we are learning more through people we have met in local astronomy clubs. We will definitely continue to use the stars and deep space objects throughout the entire World of Arcas series. We have so many constellations and deep space treasures waiting to inspire new and interesting characters. Get ready to meet other celestial heroes and monsters along the journey! Amy) You have an excellent website, great editor, and wonderful formatting. How have you found the experience of gearing up your very first book? Would you say there is a welcome environment for fledgling authors to make a path for themselves? B.I. Woolet) Thank you! It definitely helped that we worked together as a team. It was a long 2-year process to finish writing, but it was fun. It’s great for any couple to have a hobby they enjoy together, and creating a fantasy world was our hobby. Trying traditional publishing can be very difficult involving years of writing letters and contacting agents. We experimented with this route for a few months and then decided that we weren’t going to wait for someone to pick us up. We decided to follow the entrepreneurial spirit and do it ourselves. The environment is friendlier than it has ever been to new authors, but authors need to shop around and research to pick the best route. There are a lot of places eager to take your money and help you publish, but you may pay more and have less control over the options (and in some cases, they sell you stuff you really don’t need!) We went with a free-lance editor & interior book designer (Amy Eye) and a free-lance cover design artist (Regina Wamba). We were very pleased with the price, product, and the personal touch. Amy) What is written in the stars for the future of this series? I’m certainly looking forward to the next book and hoping for some more to follow after. B.I. Woolet) The next book will bring back our beloved band of heroes from book one, but they will have difficult new struggles to overcome. The old evil may be gone from Arcas, but a greater darkness has risen in his place. We are also going to shake a few things up in Jackson’s life on Earth, which will lead him to willingly return to the other world. We have more stellar characters to reveal in Arcas, more ancient legends, and more twists! Make sure you stop by your preferred local bookseller to pick up a paperback or click here for an Amazon kindle edition. You can learn more about the World of Arcas at their amazing website: www.worldofarcas.com; as well as, visiting them on twitter @worldofarcas or on Facebook.